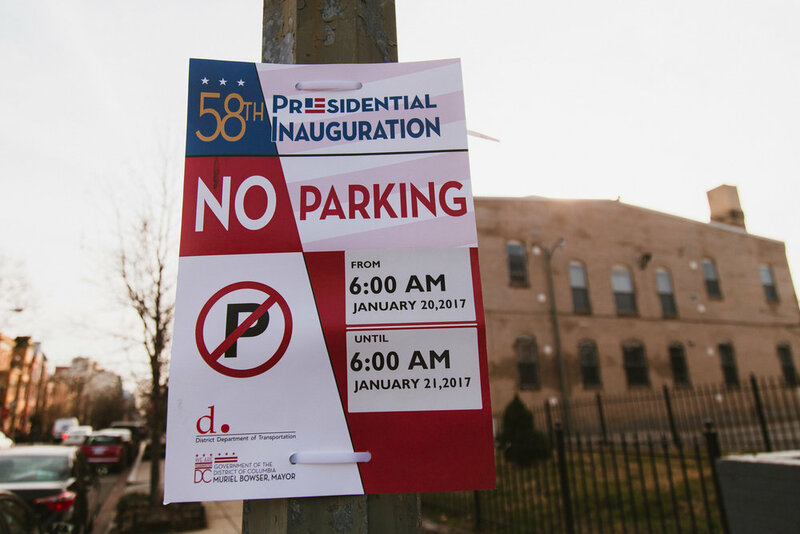 I woke up at 6am for the final prep day for the inauguration to slowly make my way towards the Capitol building. Most of the roads downtown are blocked off by DC metro police and an array of fences and white concrete barriers prevent vehicles from passing, forcing me to take winding route towards my destination. I managed to find a parking spot 3 blocks back on the hill. 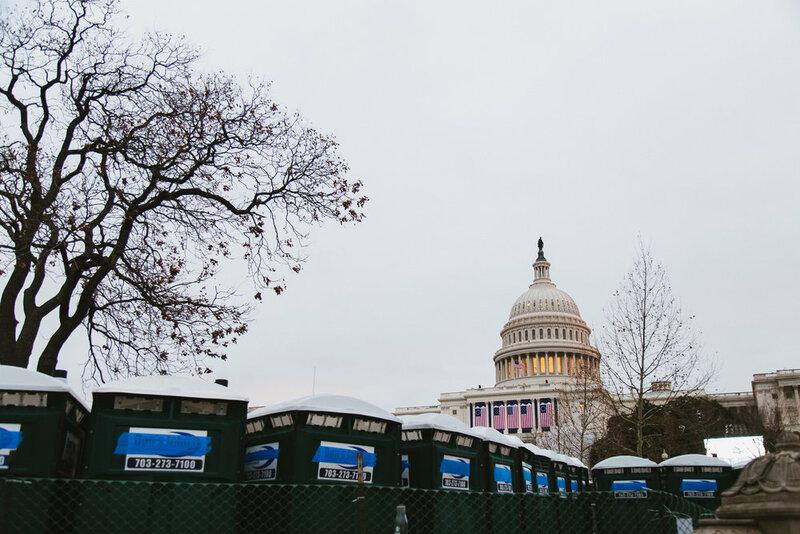 The Capitol at sunrise was a surprisingly peaceful place. Downtown DC stretched out from behind the illuminated Capitol dome and its lights glittered in the pre-dawn darkness. It felt surreal that, in 24 hours, that same stretch would be filled with hundreds of thousands of spectators, police, and VIPs. Aside from a hand full of runners and staffers navigating he narrow paths between the 8 foot tall crowd barriers, all was quiet. 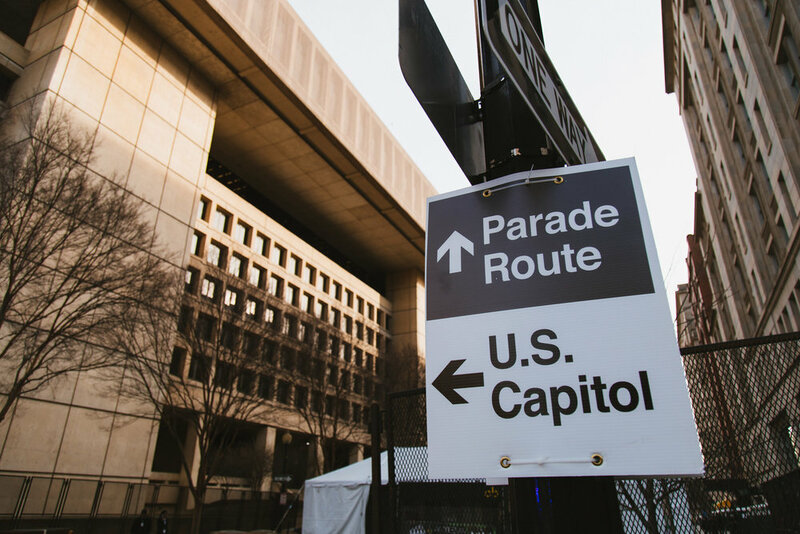 Closer to the Capitol, satellite trucks and dozens of pre-fab trailers lined the South side of the building along with a row of catering trucks emitting savory smells from baking food. A few scattered news crews were setting up outside of the ticketed seating areas as the sun began to turn the sky pink and gold. Seen from across the reflecting pool with only one other lone cameraman for a companion, it really was a beautiful morning. As the sun cleared the horizon, I began to make my way back through gridlocked traffic as thousands of commuters squeezed onto the remaining open roads near the hill. Around me, lights began to turn on in the windows of row homes and apartments as the city came to life. 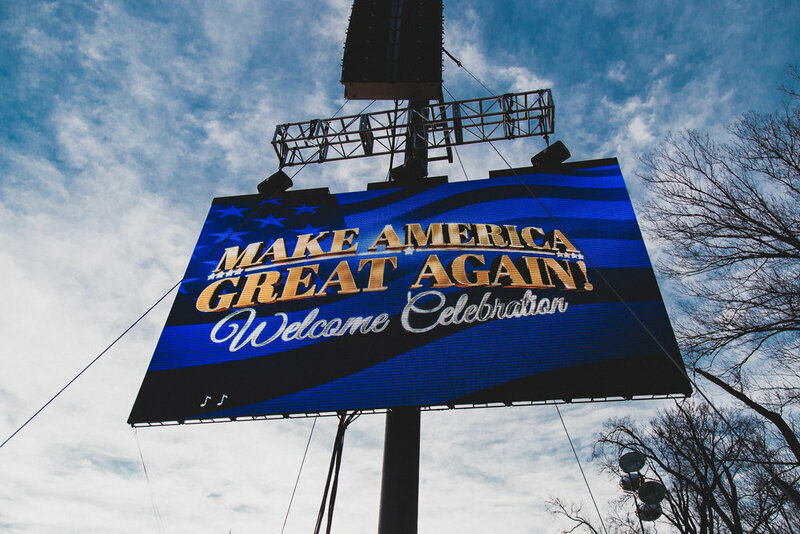 Later that afternoon, I walked down to Pennsylvania Avenue along route for tomorrow's Inaugural Parade. 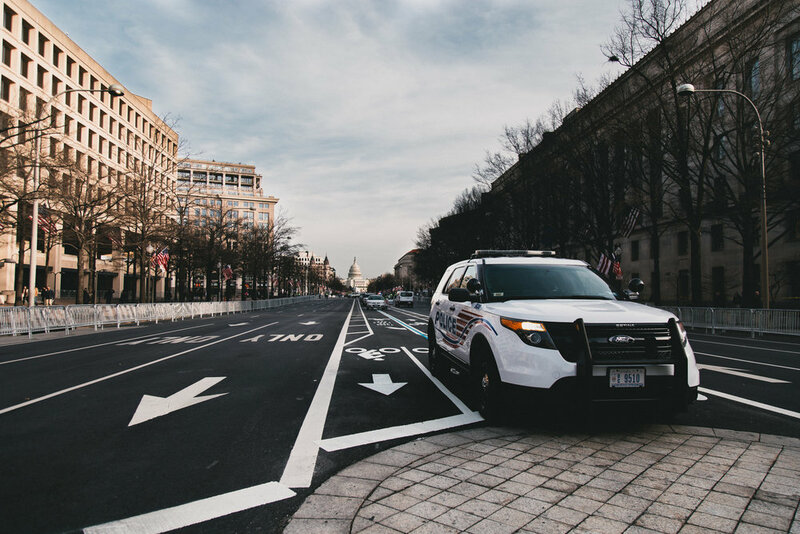 The whole street from the Capitol to the White House is blocked off and bikers and pedestrians strolled down the empty street, past the metal fences and dozens of parked police cars. In contrast to the morning, there was now an atmosphere of excitement. 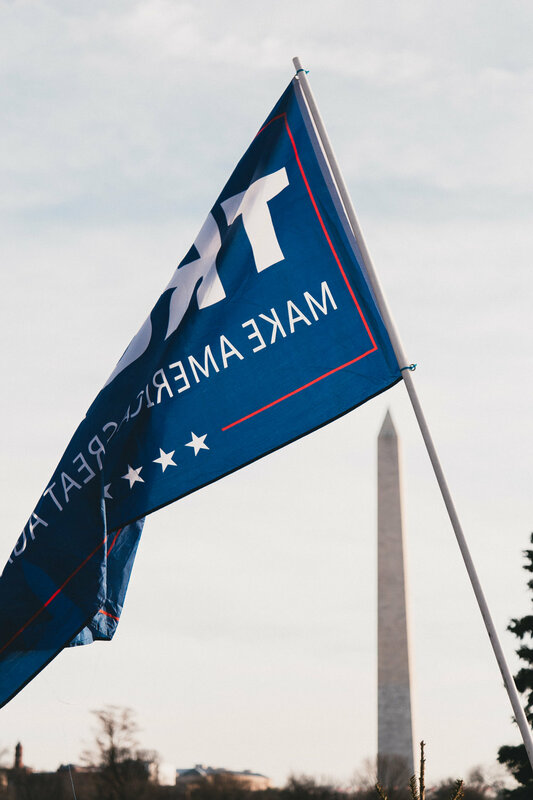 Supporters wearing "Make America Great Again" caps and waving giant Trump flags bustled down the sidewalks toward the National Mall. Around them, entrepreneurial vendors touted commemorative pins, shirts, hats, and other memorabilia. It felt almost like a beach town boardwalk at the height of summer. I spoke with an older couple outside of Trump International Hotel, now protected by three rows of fencing, who came up from Alabama to see their first inauguration. 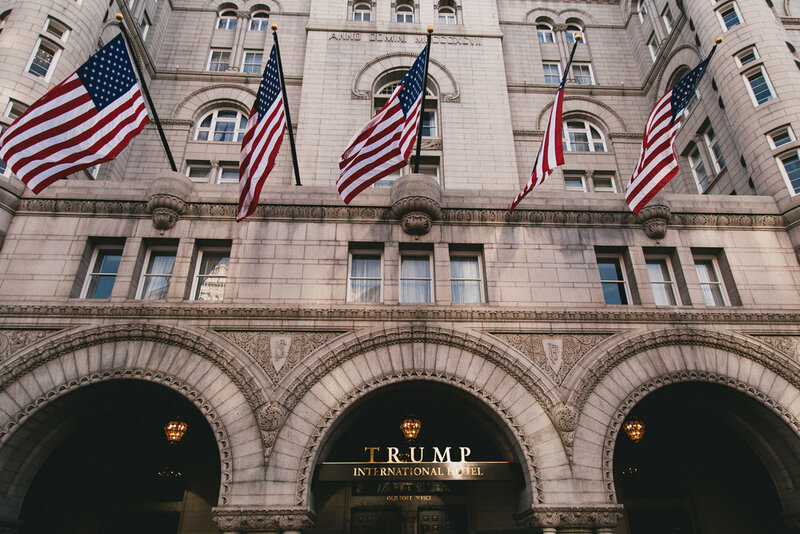 They had stopped outside of the hotel in hope that they might catch a glimpse of the President Elect. 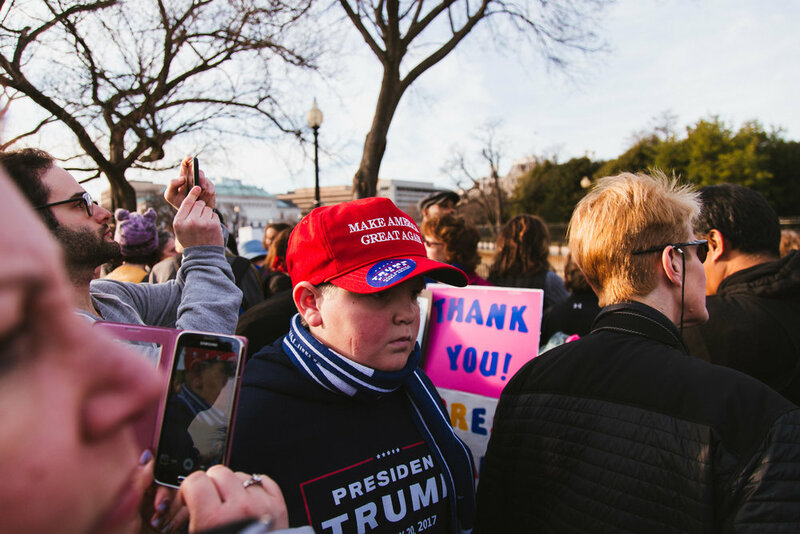 Closer to the White House, a crowd had gathered on the South lawn. Here, I began to see a few Obama supporters mixed in with the masses. One person held a Clinton / Kaine sign above their head. 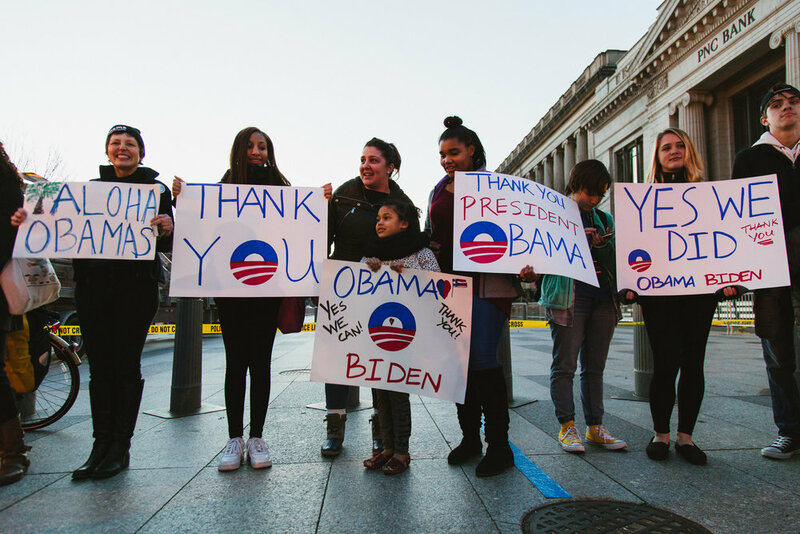 Some people had come to take one last jab at Obama while others were there to say thank you. Most came to take selfies. Somewhere in the crowd a slow and quiet rendition of Amazing Grace broke out. 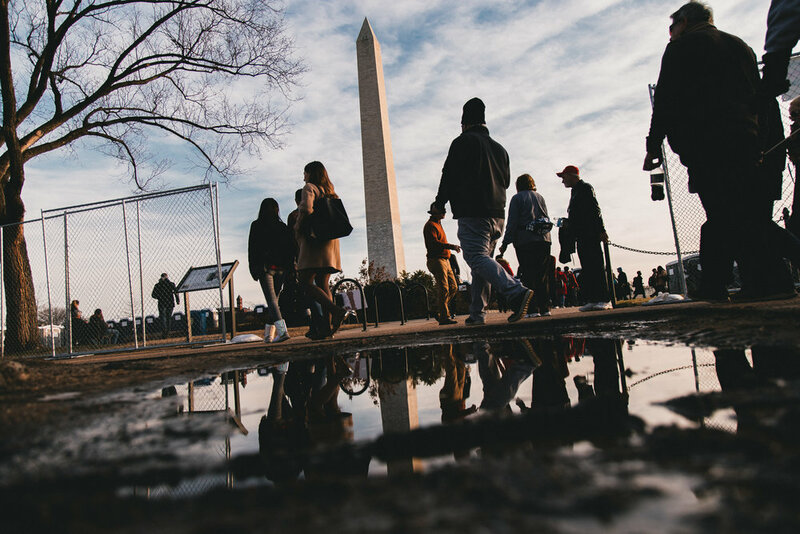 Around me, opposing groups passed inches away from each other and jostled for position, united at least in this moment by a mutual interest in having their picture taken in our nation's capital. 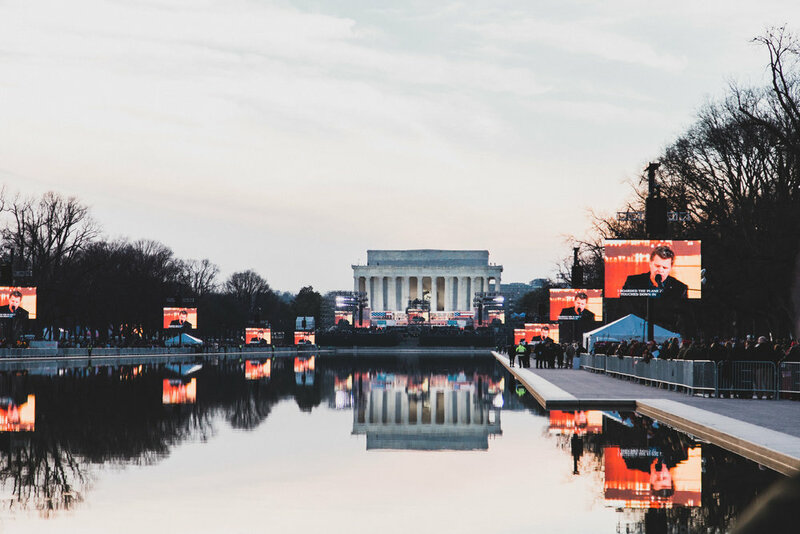 I followed the echoing sound of distant, amplified music past the Washington Monument and towards the Lincoln Memorial and the welcome ceremony. It was around this time I noticed a puzzling commonality amongst many of the Trump supporters. 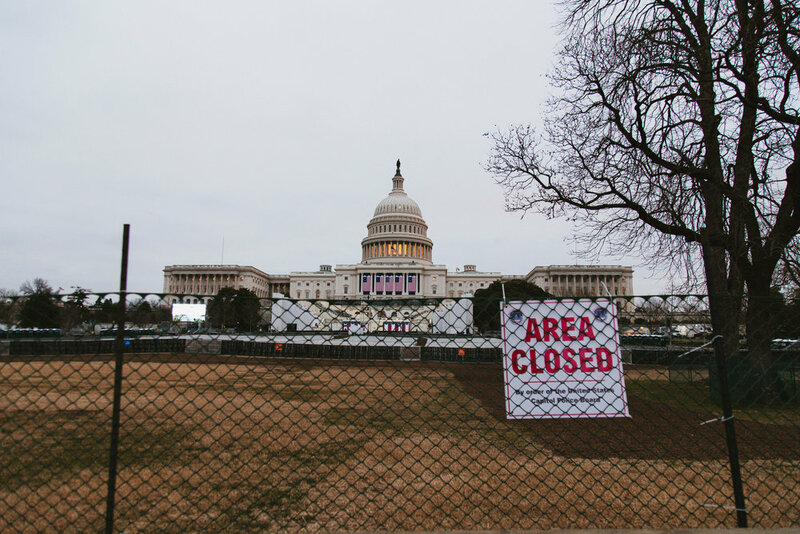 Upon walking onto the mall, many of them began reciting lines from the Forrest Gump scene that takes place there. Calls of "Ginny" laden with thick, faux-southern accents punctuated the music. The welcome ceremony itself was surprisingly subdued. Even from the closest crowd barricade, it was impossible to see the performers a few feet away on an elevated stage. The younger members of the crowd showed little interest in most of the musical guests anyway and many of them sat or lay down on the ground. on the edges of the crowd. Then Donald Trump appeared. A slowly building cheer swept through the crowd as those further back, stuck watching the events on giant TV screens, realized he had arrived. 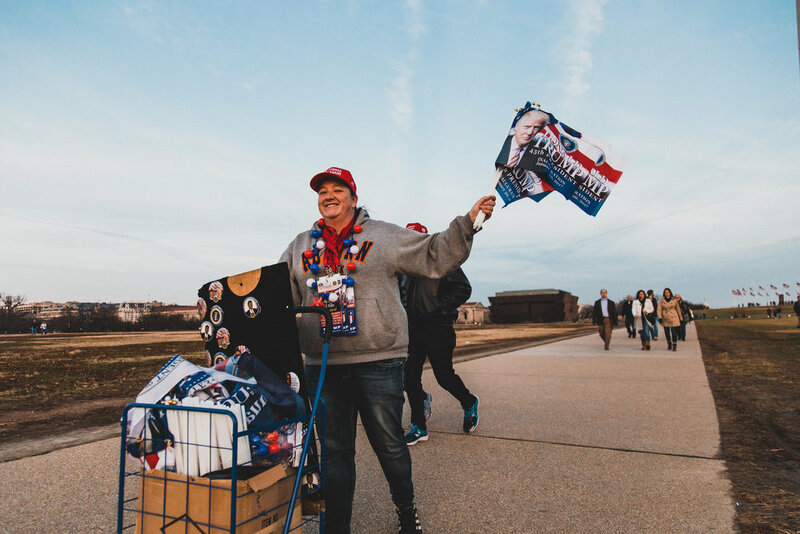 On my walk home, I passed a handful of well wishers near the White House using the "Thanks Obama" phrase in a sincere way. They were greeted by a few kindred spirits who stopped to talk as well as several shouts of "yuck" and "no thanks" from passersby. A few yards past them, a security guard and an out of town visitor loudly debated political views. 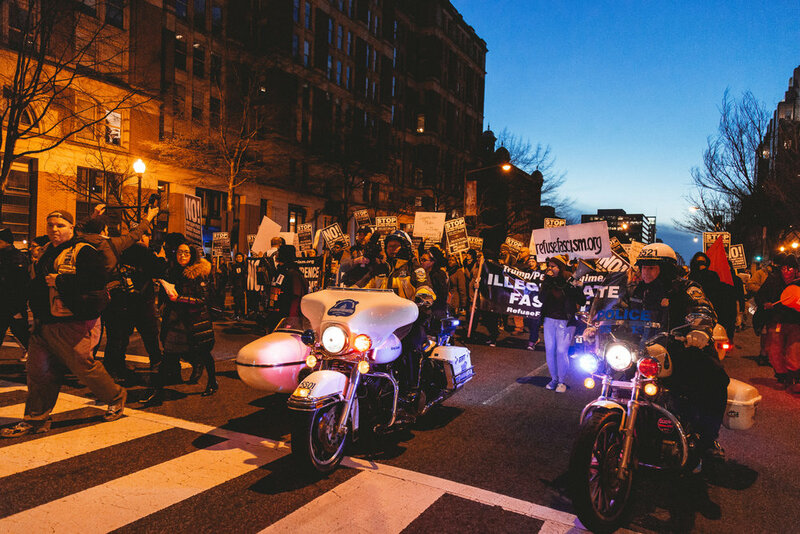 Once I got to K Street, I saw the tell-tale slow moving line of police cars and bikes that indicate a protest. Although probably only 70 or 80 in number, the protestors managed to shut down the whole road as they marched East, away from the White House. 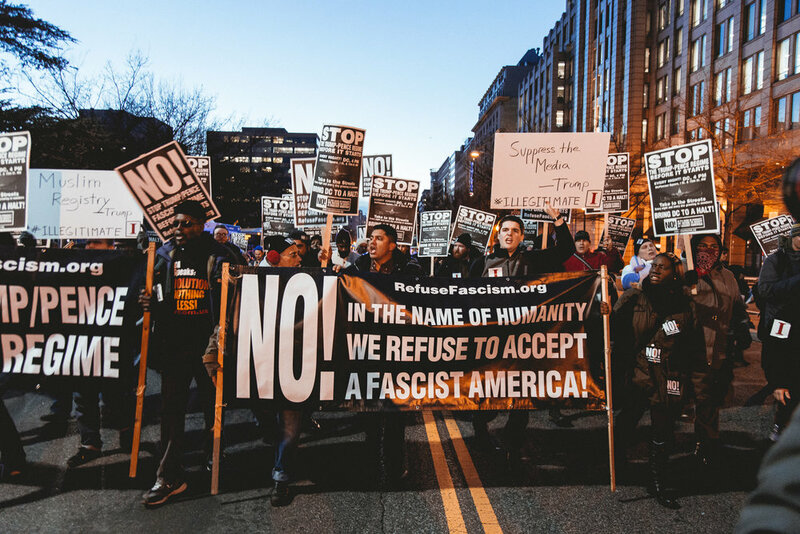 They've changed the cadence of the chants since I first heard them on November 9 and 10 but the message is the same; "No Donald Trump, No KKK, No Fascist USA." These kinds of small protests have been a nightly occurrence in DC during the week leading up to the inauguration. We reached 11th street as the last daylight started to fade and I turned and went home.